Halloween was almost here. I'd better get working on our costumes, I thought. I ran to K-Mart and bought the black tights. I had an awful lot left to do in order to finish the costumes for my husband and myself let alone finish making the kids theirs. My daughter was going as a cowgirl and her's was nearly completed. My son wanted to be Spiderman and we had found a "Spidey" suit for him. There was just something about those darn super heros back then. It was the biggest rage. Super heros were really "in." I had finished the hat and was working on the cape. This would be a big hit at daycare, I thought. The next morning, I got my daughter off to school and got Spiderman ready. Then I got dressed and when I came out, my son loved it! He kept telling me that I looked real. I was dressed as a witch and had even smeared green eye shadow on my face. I got my orange pumpkin and filled with the candy and the black rubber spiders I'd bought. My son thought that it would be great fun. 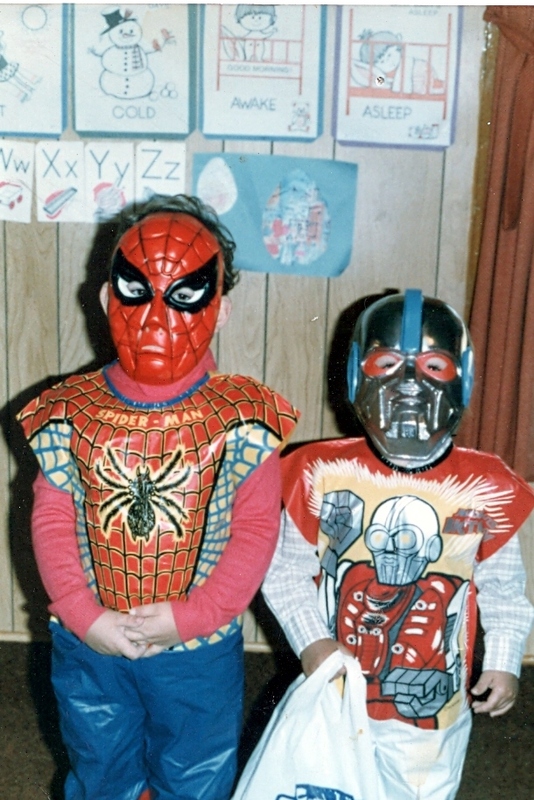 Here's a picture of my "Spidey" at the age of four and one of his best friends, Eric. When the teachers at daycare asked me to plan something "special" for the kids, they loved the idea of the wicked witch coming to visit. So when my son, they had me simply wait in the backroom until it was time. After the kids finished playing all their Halloween games, it was time. They gathered in the playroom and in I walked, all hunched over, swirling that darn cape around me to and fro. I heard a few of them gasp as I let out a mean "eh..eh..ehhh." The teachers had told the kids that if they wanted a treat from my pumpkin bucket they had to come up the witch and sit on her lap, reach into her bucket and that they would either pull out a "trick" or a "treat." Sounded easy enough. Things were going pretty well, until little Adrian (one of my sons closest buddies) had to take his turn. He got up to me, climbed on my lap and when he looked closely at my green face, he began to cry! It just made my wicked witch heart melt in two. Without even hesitating, and hugging him tightly, I said, "oh no, Adrian...it's me...Jason's Mommy." The jig was up...I had blown my own cover! 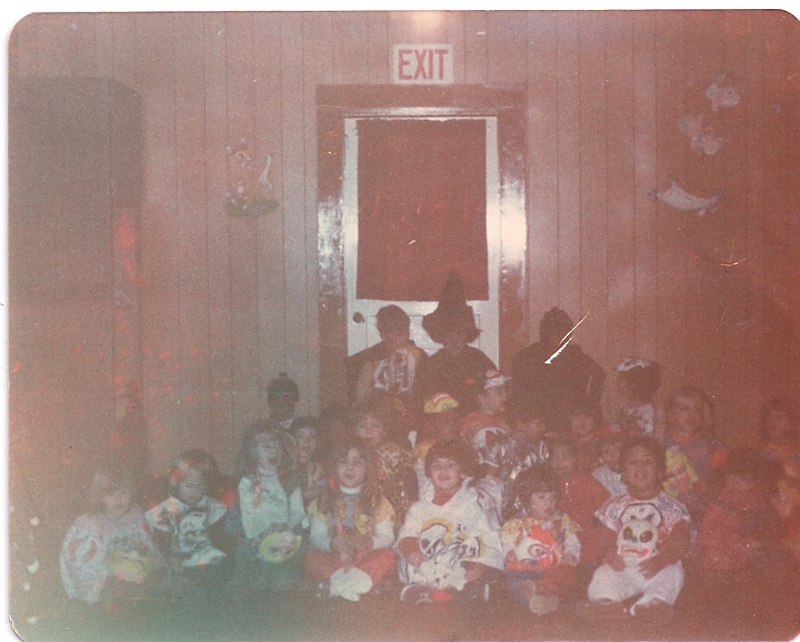 I apologize for the quality of the picture...but it is from the olden days...eh, eh, ehhhhh...after all, witches live forever!!! LOL! Hmmm. I could make a witchy comment here ;-) Sounds like fun - love that you got to play the class witch! I love it. How neat that you went and participated in the daycare. What great memories! You really must had been scary looking! lol I miss the good old days like that when a kid could be a kid. Now they have Fall Parties instead of Halloween parties. They don't even get to dress up in their costumes at school. That used to be so much fun when I was in school. I have a hunch your children are around my age. Those spider man costumes were the rage when I was in grade school. The photos are just precious and I love these kinds of memories. Great story and what a great mom you are :) Fun story!